Summary of Recommendations In light of the approaching tenth anniversary of the African Union Mission in Somalia (AMISOM), the Peace and Security Council (PSC) of the African Union (AU) on 6 September 2016, authorized the AU Commission to begin the process of producing “a comprehensive lessons learned exercise, which will identify progress made, challenges encountered and more importantly recommend options on the way forward in the future of AMISOM, including the Mission Exit Strategy.” This request was re-iterated during the 649th meeting of the AU PSC on Somalia, on 23 January 2017, where PSC members requested the finalization of the ten-year lessons learned study. In light of the approaching tenth anniversary of the African Union Mission in Somalia (AMISOM), the Peace and Security Council (PSC) of the African Union (AU) on 6 September 2016, authorized the AU Commission to begin the process of producing “a comprehensive lessons learned exercise, which will identify progress made, challenges encountered and more importantly recommend options on the way forward in the future of AMISOM, including the Mission Exit Strategy.” This request was re-iterated during the 649th meeting of the AU PSC on Somalia, on 23 January 2017, where PSC members requested the finalization of the ten-year lessons learned study. 1. Political consultations between the AU Peace and Security Council and the UN Security Council have remained at an informal level and it is proposed that the two Councils need to move a step further and undertake concerted, systematic joint analysis to allow for greater harmonization of mandates for AMISOM between the UNSC and AU PSC. 2. Develop a consensus on what roles the AU should play beyond peace enforcement with regard to the policing and civilian components of international engagement in Somalia. 3. The AU should improve its strategy on how to transition AMISOM from a more military-led intervention focused on degrading al-Shabaab to a robust multidimensional stabilization and post-conflict reconstruction and development mechanism. 4. There is a need to develop Standard Operating Procedures (SOPs) to ensure that UNSOS is involved and effectively delivers in the implementation of AMISOM Concept of Operations (CONOPS) from the onset. 5. AMISOM and its partners must strengthen their focus on empowering the Somali National Security Forces and developing effective institutions of governance to sustain results by delivering a “peace dividend” to populations in areas recovered from al-Shabaab. 6. AMISOM must develop more effective strategic communications in order to disseminate its narrative and key messages to the right audiences, particularly to Somalis. 7. Ensure greater coordination and cooperation, including the possibility of co-location between UNSOM and, the civilian component of AMISOM. 8. There is an urgent need to align mandated tasks and available resources, including strengthening the role of the AU Commission to better manage peace support operations by improving ongoing efforts to enhance human resources, administrative and financial procedures. 9. There remains a need to strengthen information-sharing and knowledge management between the AU Commission and AMISOM, including the capabilities to capture and disseminate lessons learned. 10. There remains a need to continually adapt AU policies and guidelines to fit the challenges posed by the realities on the ground in Somalia. 11. AMISOM should deploy civilian capacity at the Federal Member State level, and act as liaisons on stabilization through daily interaction with local/regional administrations and communities and linkage with development actors in Mogadishu, as well as providing necessary guidance to sectors on QIPs. 12. To improve current command and control structures for AMISOM’s military component, TCCs should give space to the Force Commander to control his troops, including by strengthening communications. 13. AMISOM’s capabilities should be aligned with the nature of its operations, including by placing greater emphasis on the key elements of counterinsurgency doctrine to enable enhanced mobility, accurate and timely intelligence-gathering, and adequate logistical support. 14. AMISOM should produce more data on the extent to which the Mission, its partners, and the Somali National Security Forces have degraded al-Shabaab capabilities. 15. AMISOM should receive an additional capability surge of troops, enablers and intelligence enhancement in order to successfully execute renewed offensive operations along the Juba valley. 16. AMISOM needs to strengthen the integration between its military, police and civilian components in order to deliver the Mission’s objectives. 17. AMISOM should strengthen its counter-IED capabilities. 18. AMISOM should pursue a condition-based exit strategy anchored on an inclusive politically agreed set of Somali security institutions and tied to the minimum capacity of the Somali national security forces to take over, as well as more broadly promoting a strong sense of Somali leadership and ownership for the political, security, and economic direction of Somalia. 19. There needs to be more effective training and leadership development of the Somali national security forces, including through better coordination of capacity building support amongst relevant partners. 20. AMISOM and its partners should recalibrate the strategy for developing an effective set of Somali National Security Forces and sketch an appropriate roadmap. In the short-term, there should be increased co-location of the SNA and AMISOM and more joint operations and mentoring, with the SNA increasingly being given leading roles. 21. AMISOM continued presence in Somalia will be significantly influenced by the availability of predictable and sustainable resources of the Mission. 1. In light of the approaching tenth anniversary of the African Union Mission in Somalia (AMISOM), the Peace and Security Council (PSC) of the African Union (AU) on 6 September 2016, authorized the AU Commission to begin the process of producing “a comprehensive lessons learned exercise, which will identify progress made, challenges encountered and more importantly recommend options on the way forward in the future of AMISOM, including the Mission Exit Strategy.” This request was reemphasized during the 649th meeting of the AU PSC on Somalia, on 23 January 2017, where Council members requested the finalization of the ten-year lessons learned study. iv. AMISOM’s exit strategy: to determine how the Mission might transform to facilitate a successful takeover by Somali security services. c. Operational successes and challenges. d. Multidimensional components as an integrated mission. f. Experiences of building the Somali security forces. g. Relationships with its partners. 4. The background paper identified both challenges and opportunities, highlighting what has worked for AMISOM thus far as well as what could have worked better in the Mission. Participants emphasized that any assessment of AMISOM’s achievements and challenges should start from the recognition that Somalia is an extremely complex operating environment for a peace operation. This is due to a variety of factors including the limited effectiveness of state institutions, the large number of armed groups (hostile and non-hostile) and their tendency to shift alliances, the involvement of regional and other external actors, and the fact that AMISOM was required to undertake a complex multifaceted mandate, including urban warfare, stabilization and counterinsurgency. 5. There was broad agreement that AMISOM had achieved its principal strategic goals, notably protecting the successive Somali authorities (the Transitional Federal Government and Federal Government of Somalia) and later the Interim Regional Administrations, degrading al-Shabaab, and securing two election processes that produced federal governments in 2012 and 2016/17. Much of the credit for these accomplishments was due to the perseverance and innovation of AMISOM personnel at the strategic, operational and tactical levels who repeatedly overcame unforeseen challenges. 6. The lessons as identified by participants at the conference are structured along four key areas: Political; Strategic; Operational; and Exit Strategy. 7. Strengthening the mandating process and working level engagement has gone a long way in ensuring alignments between the UN Security Council and the AU PSC. Improvements in the harmonization process began in 2011, including the role of the regular consultations between the memberships of the two councils; principal-level discussions (including the Joint Task Force) and the authorisation of joint planning and management initiatives (including joint benchmarking and assessment teams as well as working groups). 8. Nevertheless, consultations between the two councils have remained at an informal level and there was a suggestion that the two councils might move a step further and undertake concerted, systematic joint analysis to allow for greater coherence between individual decisions. It was also observed that despite the AU’s initial vision for AMISOM, there was no political agreement on transitioning AMISOM into a UN peacekeeping operation despite the UN Security Council also envisioning AMISOM as an interim stabilization measure. This issue still clouded UNSOM-AMISOM relations. 9. The outstanding questions relate to more fundamental issues of subsidiarity and complementarity; especially the discussion of what roles the AU should play beyond peace enforcement with regard to the policing and civilian components of international engagement in Somalia. It was noted in this context that the current administrative and financial procedures at the AU are inadequate to meet the needs of most of its peace support operations. Participants agreed on the need to harmonize the AMISOM’s mandate since it comes from more than one source of authority. It was noted that conceptual gaps still exist between the UN and AU (including at secretariat levels) and that these need to be bridged and harmonized. Some of these gaps are related to interpretations of the UN Charter and the AU Constitutive Act on the principle of subsidiarity and comparative advantages related to conflict resolution issues. Others relate to the nature of the strategic partnership between the UN and AU, and relations between the AU and IGAD. Consequently, participants identified the need to strengthen the harmonization of mandates for AMISOM between the Security Council and AU PSC. 10. Participants agreed that AMISOM had remained too military heavy. This was understandable during AMISOM’s early years when insecurity in Mogadishu prevented the deployment of the Mission’s police and civilian components. Since late 2011, the Mission was too slow to realize its multidimensional mandate and configuration. There were even cases where AMISOM representatives were excluded from governance mechanisms in Somalia because it was seen as a heavily military Mission. 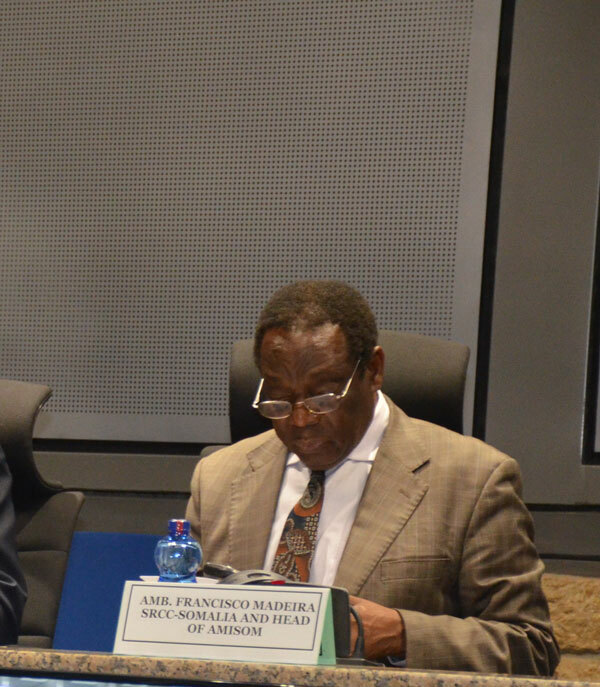 Consequently, it was noted that there was no question about the necessity for AMISOM’s multidimensional composition. 11. Participants also noted that even though AMISOM is a multidimensional mission, there was limited guidance on the role, and integration, of the non-military components against Mission goals. It was recognized that the African Union has a comparative advantage in immediate stabilization and support to the political process were seen as salient. In this regard, it was recommended that AMISOM deploy civilian capacity at the state level, and act as liaisons on stabilization through daily interaction with local administration and communities and linkage with development actors in Mogadishu, as well as providing necessary guidance to sectors on QIPs. 12. One of the areas of repeated disconnect in the AMISOM “model” was the relationship between AMISOM and UNSOS. Specifically, a disconnect was identified between the timing of the UN budget approval process and the various iterations of the revised AMISOM CONOPS. There is a need for UNSOS to be involved in the CONOPS planning process from the onset to ensure delivery on the requested support in a timely manner. It was suggested that relevant SOPs be developed as a way to formalise the necessary coordination. 13. Participants were in agreement that AMISOM and its partners have not been able to sufficiently empower Somalis so that they can take over from the AU Mission. The question was raised of why Somali National Security Forces have not developed sufficiently during AMISOM’s ten years of operations? AMISOM and its partners must therefore strengthen their focus on empowering the Somali national security forces and developing effective institutions of governance to sustain results by delivering a “peace dividend” to populations in areas recovered from al-Shabaab. This would also involve the need to secure the Main Supply Routes between AMISOM and SNA bases across south-central Somalia and thereby facilitate the delivery of humanitarian assistance. This took on even greater urgency in light of the current famine and drought. 14. Participants agreed that it was imperative for AMISOM to develop more effective strategic communications. Somalis are constantly evaluating AMISOM and are not always coming to positive conclusions about the Mission’s impact. This raised the question of why there might be a divergence between AMISOM’s self-image as a broadly successful operation and local populations who do not necessarily appreciate the Mission’s achievements in the same way. Participants agreed on the need for AMISOM to more effectively develop its narrative and key messages to tell its story to the right audiences, particularly to Somalis. Concern was expressed that despite having a broadly positive narrative to tell, AMISOM continued to lose the battle on social media. Participants emphasized that the solution lay not solely with improving the Mission’s strategic communications instruments but with encouraging a comprehensive response that generated political buy-in and support from Somalia’s political leaders, civic associations and ordinary citizens. In sum, a unified political response was needed to prevent radicalization and fight against extremist ideology propagated by al-Shabaab. This would require capabilities and resources in support of the current AU-UN Information Support Team. It would also require Somali scholars, intellectuals and politicians to come out in public and denounce al-Shabaab and explain why its ideology is wrong, dangerous, and unacceptable. 15. In discussions on AMISOM’s civilian component, it was observed that some clarification was needed on cooperation and division of labour between UNSOM and the civilian component of AMISOM. It was emphasised that the conceptual origin of AU PSOs is based on multidimensionality, comprising of civilian, police and military components. There was a need to deepen the support provided by UNSOA/UNSOS to AMISOM civilian and police components, in order to improve effectiveness. 16. Participants agreed on the urgent need to align mandated tasks and available resources. This should include ensuring that the question of appropriate resources and capabilities is part of the initial deliberations about the Mission’s mandate. However, participants also noted that there was a tendency for the UN Security Council to set ceilings for funding and allow financial imperatives to drive the discussion of force requirements rather than the other way around. There was also consensus that AMISOM had been consistently under-resourced in key areas throughout its entire ten years of operations. Not only were the authorized capabilities insufficient compared to the mandated tasks but the AU and its partners inadequately generated and deployed the authorized forces, leaving AMISOM lacking significant capabilities in the field. Notably, AMISOM forces were generated from only approximately 8% of the AU’s 54 Member States, which is significantly lower than other AU PSOs such as the African-led International Support Mission in Mali (AFISMA) where Member States pledged more capacities for less complex multidimensional peace support operations. While it was acknowledged that the AU Commission had struggled to ensure effective force generation for AMISOM, it was also noted that the Mission’s TCCs must also deliver forces as per the terms of their MoUs, including related to the clauses concerning sustainment capabilities and equipment. A suggestion was made that the PSC might want to ensure that relevant resources were available before mandating peace operations. 17. There was discussion as to how the principle of subsidiarity should influence the AU’s strategic management of AMISOM. It was noted that there is a need for enhancing collaboration between the AU and IGAD in the political engagements on Somalia. 18. 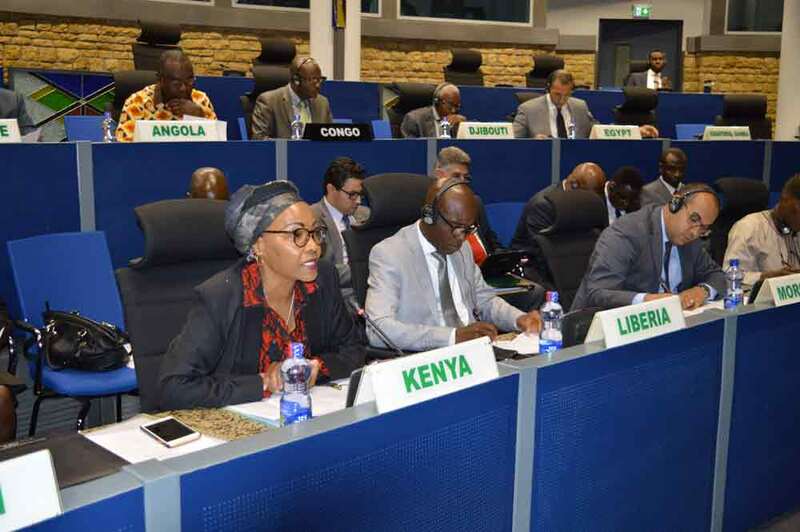 Consensus emerged on the need to strengthen the role of the AU Commission, which is the strategic headquarters for the Union’s peace support operations in general. In addition, it was noted that once a PSO is authorized, there must be a Commission-wide approach to supporting it. There have been previous efforts to ensure coordination amongst various PSD divisions and other AUC departments, such as the now defunct Peace Support Operations Coordinating Committee (PSOCC), established and chaired by the Deputy Chairperson to meet on a monthly basis and bringing together representatives from PSOD, PSD Finance and other departmental representatives, Internal Audit, Human Resources to discuss matters relating to ongoing operations, share information and provide updates on issues related to operations and mission support. In the case of AMISOM, not only did the AU Commission lack a prepared force generation plan, it also did not adequately marshal all its component parts in support of the Mission. Areas identified for strengthened involvement by the AU Commission included Post Conflict Reconstruction and Development, State Building, Rule of Law and Security Institutions (Security Sector Reform; Disarmament, Demobilization and Reintegration) and Political/Civil Affairs. Calls were also made for closer involvement of the Commission’s Department of Political Affairs and the Defence and Security Division of PSD. 19. Participants noted that the strategic management of AMISOM was consistently hindered by limitations relating to human resources. Not only were there challenges related to force generation, bureaucratic systems to hire and retain appropriately qualified personnel were not aligned to the need for rapid deployment. Staff retention and rotation also proved challenging, especially for personnel with specialized skills (e.g. intelligence and security sector reform). This, in turn, hindered mandate delivery and the establishment of a well-functioning working relationship with UN counterparts. Current administrative and financial procedures at the AU are inadequate to the needs of a peace enforcement mission. It was suggested that it would be imperative to find a way to better integrate the AU Peace Support Operations Division (PSOD) with the Administration and Finance Department. 20. Participants also raised the need to strengthen AU-AMISOM information-sharing and knowledge management. Between 2007 and 2017, the AU PSC issued over forty communiqués on the situation in Somalia, indicating its seriousness and AMISOM as one of its priorities. Yet although a decision was taken in 2011 for the PSC to visit AMISOM in Somalia no such visit was undertaken until October 2013. From the start of the Mission in 2007, daily strategic management of AMISOM was under an ad hoc arrangement, the Strategic Planning and Management Unit (SPMU), which combined personnel from the AU, UN, NATO and other partners. It was not until 2012 that the planning and management of AMISOM transitioned to the PSOD. In addition, a real time video-conferencing system between PSOD and AMISOM was not established until 2009/10. On the basis of better communication, participants also agreed on the need to strengthen documentation about AMISOM to ensure lessons learned are captured and disseminated. As the only AU mission that has lasted more than two years, AMISOM can potentially generate a rich body of lessons learned that has the potential to influence future AU PSO doctrine. 21. A related point was raised about the continued disconnect between the nature of AU peace operations and the available policies and guidelines. Specifically, the AU has largely relied on UN guidelines crafted for a peacekeeping context. Yet there is a fundamental mismatch between the UN’s processes and systems designed for peacekeeping and the tasks at hand for AMISOM, which involve counterinsurgency, stabilization and war-fighting. There is therefore a need to adapt AU policies and guidelines to fit the challenges posed by the realities on the ground in Somalia, which call for enforcement. 22. Participants noted that although AMISOM had achieved a variety of operational successes over the last decade, some of those gains remained fragile and could be reversed, especially if Somalia governance structures could not deliver safety, services and justice to local populations in the areas recovered from al-Shabaab. 23. It was noted that effective operations require an effective command and control structure. Participants reiterated that AMISOM’s command and control structures had not always performed effectively and could be improved. In many instances, the command of AMISOM troops was exercised not by the Force Commander but from the national capitals of the TCCs. In contrast, participants observed that command and control structures for AMISOM’s police component had not suffered similar problems. To improve current command and control structures for the Mission’s military component, it was suggested that TCC Governments should empower the Mission’s senior leadership including the Force Commander to control his troops. Furthermore, communications should be strengthened; both by ensuring better communication between the AU, AMISOM and TCCs, as well as between the Mission Force Headquarters and Sector Commands. While the establishment of the intelligence (J2 cell) had improved the situation, more could be done in this area. 24. Another point of consensus was the need for available capabilities to be aligned with the nature of AMISOM’s operations. This meant placing greater emphasis on the key elements of counterinsurgency doctrine, which require mobility, accurate and timely intelligence-gathering, and adequate logistical support. AMISOM’s operations must therefore be politically coherent, information-led, and recognize that insurgencies like al-Shabaab are best beaten by local forces and governments rather than foreigners. In practice, however, AMISOM had become bogged down and vulnerable with its forces stretched across a very large area of operations. AMISOM had also previously focused too much effort on capturing territory rather than degrading al-Shabaab’s core combat capabilities. AMISOM’s forces were over-stretched as a result and struggled to bring with them local Somali troops, police and administrators. When implementing its current mandate to degrade al-Shabaab, participants noted that AMISOM was not optimally configured to deal with al-Shabaab’s more asymmetric tactics and it would be useful to produce more data on the extent to which AMISOM and the Somali national security forces had degraded its capabilities. 25. With regard to logistics, participants noted the challenge that AMISOM does not control its logistics, which come from the UN and other forms of partner support. This placed a premium on ensuring a good working relationship between the AU and UNSOS. It was also noted that UNSOS was regularly asked to engage in innovative activities, including fixing partner-donated vehicles to the AMISOM TCCs that did not come with their own maintenance packages. 26. Participants also called for AMISOM to receive an additional troop surge in order to successfully execute renewed offensive operations along the Juba valley. In addition, effective offensive operations would also require AMISOM to emphasize intelligence enhancement and generate more enablers to help in the fight. 27. There was a strong consensus that AMISOM needs to strengthen the integration between its military, police and civilian components in order to deliver the Mission’s political objectives. It was noted that AMISOM’s police component had achieved a number of successes but remained under-resourced. One innovation had been the decision to split some of AMISOM’s Formed Police Units to operate at platoon level in order to support the most recent election process in Kismayo and Baidoa. Part of operating as a more multidimensional operation should entail developing an active CIMIC element. AMISOM’s limited CIMIC operations were noted as having played a critical role in winning hearts and minds amongst the local population. Yet, AMISOM was not well configured to undertake more intense levels of CIMIC activity. 28. With regard to AMISOM’s civilian component, it was agreed that its role should be integrated and complementary to the military effort by leveraging support from all the key stakeholders and partners to generate the political and governance actions necessary to make the overall stabilization strategy a success. Put simply, stability cannot be sustained if a political settlement is not forthcoming and if the governance vacuum in recovered areas is not filled. There could also have been clearer leadership in the mission. It was observed that AMISOM’s senior civilian leadership was largely absent from Somalia during the first five years of the Mission. There was also little done to track and assess the contribution of the civilian component against mission goals and better integrate it into AMISOM’s planning processes. The result was that for too long the civilian dimension was treated as a low priority. Consequently, it was noted that AMISOM still lacked staff in a number of key positions, including in the Joint Support Operations Centre (JSOC) and mission support positions more generally. It was suggested that there should be a significant increase in the capacity of AMISOM’s political and civil affairs staff, including by hiring more Somali nationals especially to work at the regional and local levels. 29. A consensus of opinion emerged that AMISOM needed to strengthen its counter-IED capabilities and deploy additional force multipliers, especially the attack helicopters that had been authorized by the UN Security Council in 2012. Although AMISOM had received in December 2016 three Kenyan helicopters, these were utility aircraft and not the type of gunships required to destroy al-Shabaab’s combat assets. Given the long-standing problems of generating these assets, it was suggested that the AU should look beyond the AMISOM TCCs to other African countries and perhaps beyond the continent. 30. Participants emphasized that the nature of current AMISOM operations should be reflected in the pre-deployment training available to the peacekeepers. Having previously required significant training in techniques of urban warfare, AMISOM operations now emphasized aspects of counterinsurgency, stabilization and countering IED networks. 31. AMISOM’s exit strategy is currently predicated on three interrelated factors: the TCCs have expressed an interest in drawing down the Mission starting in October 2018; the growing likelihood of dwindling resources from AMISOM’s partners; and the minimal prospect of a UN peacekeeping operation taking over. 32. In light of these factors, participants agreed on the need for a condition-based exit strategy for AMISOM, anchored on a politically agreed set of Somali security institutions and tied to the capacity of the Somali national security forces to take over. It was noted that the AU and international partners should guard against building only a strong SNA, in case this increased the risks of future coups, and instead develop the full range of security services. There was also some criticism of the envisioned timeline for AMISOM’s drawdown, in part because the timing is unfortunate given the political vision of “one-person-one-vote” elections in Somalia by 2020. It was suggested that it might be more constructive to talk about AMISOM’s “transformation” into a smaller, leaner, more effectivemobile counter-terrorism force rather than just its exit. 33. Participants agreed on the need to ensure more effective training of the Somali national security forces. This includes ensuring that efforts are aligned with identified needs including equipping and provision of stipends and services; there is better coordination and harmonization between the multiple training initiatives currently underway, including those involving private sector firms; and that an effective tracking mechanism is developed to efficiently utilize resources. It was also observed that although numerous trainings had been conducted of the Somali national security forces, in a number of cases, these had mainly been done for individuals and few specific units. In addition, leadership development remained an important blind spot. New initiatives were required to identify and cultivate the future leaders of the Somali national security forces, including commanders of the subsequent companies, battalions, and brigades in the SNA. 34. Concerns were raised that the SNA will not have developed the sufficient capacity within the the timelines currently envisaged for AMISOM’s withdrawal. It was noted, for instance, that with the exception of the “Danaab” battalion, not a single SNA unit was fully trained, equipped, and at full capacity to deploy, conduct operations and sustain themselves in the field. In part, this was linked to the problems in current efforts to train the SNA. But it was also noted that the inability to regularly pay Somali security forces had partly encouraged defections and undermined morale. 35. There was consequently broad recognition that the building of an effective and legitimate SNA is a long-term endeavour. Considerable emphasis was also placed on the need to recognize that security sector reform and empowering the Somali national security forces was ultimately a political issue. Without the necessary political will and agreed vision between the FGS and Somalia’s regional states, establishing an inclusive, legitimate and professional set of forces would prove elusive. Participants agreed on the need to recalibrate the strategy for developing an effective set of Somali national security forces and sketch an appropriate roadmap. 36. There was also a call for the AU and its partners to develop shorter-term solutions that would allow AMISOM to commence drawdown and reconfiguration in line with its exit strategy. It was suggested that there should be increased co-location and more joint operations with AMISOM, with the SNA increasingly being given leading roles. It was noted that a follow-up conference specifically on this topic would be useful and that the details of a “security pact” between the Somali authorities and international partners would be a key theme of discussions at the London Conference (scheduled for May 2017).